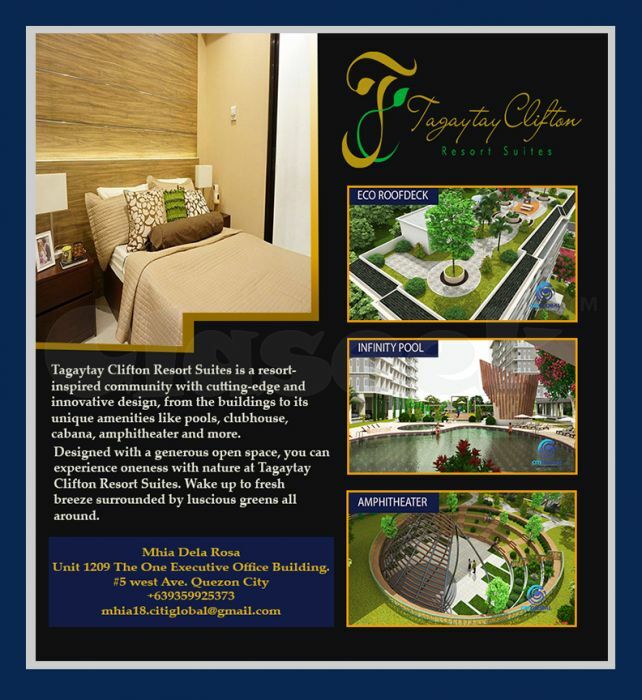 WHY TAGAYTAY CLIFTON RESORT SUITES IS A GOOD INVESTMENT? * Guaranteed monthly income whether rented out or not. * Advertising will be up to the experienced hotel management employing successful techniques in Marketing. * Maintenance is considered part of the expenses and responsibilities of the hotel management. * Payment of utility bills and other usual expenses such as insurance is handled by the management. * Monthly rental income is directly to the unit owner’s bank account. * Unit owner may occupy his own unit when taking a vacation with free 30-day stay per year. Tagaytay Clifton Resort Suites, when fully operational, shall be professionally managed by hotel operators so unitowners have nothing to worry about, but just “Keep Calm and Do Nothing.” Wake up to fresh breeze surrounded by luscious greens all around, a resort-inspired community with cutting-edge and innovative design, from the buildings to its unique amenities like pools, clubhouse, cabana, amphitheater and more!